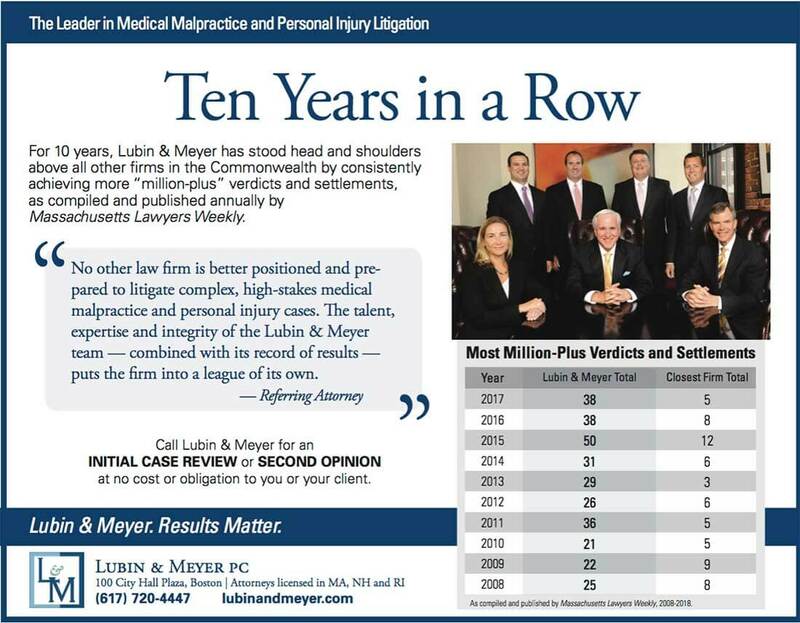 As seen in Rhode Island Lawyers Weekly. Did you know? 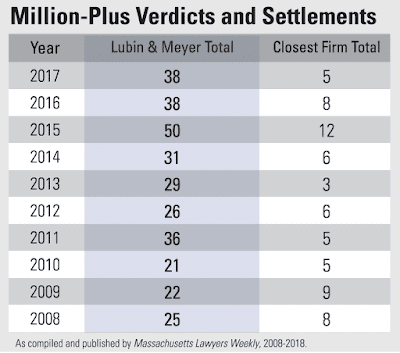 New England's most experienced medical malpractice law firm represents patients injured by medical error and medical negligence in Massachusetts, New Hampshire and Rhode Island. Lubin & Meyer is known nationwide for its commitment to quality and excellence in the preparation and trial of suits on behalf of injured victims. 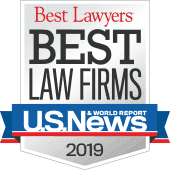 Its team of 19 lawyers, 4 nurses, paralegals and assistants evaluate and litigate every type of medical negligence case including the most complex birth injury lawsuits and those related to the delay and misdiagnosis of cancer and stroke. 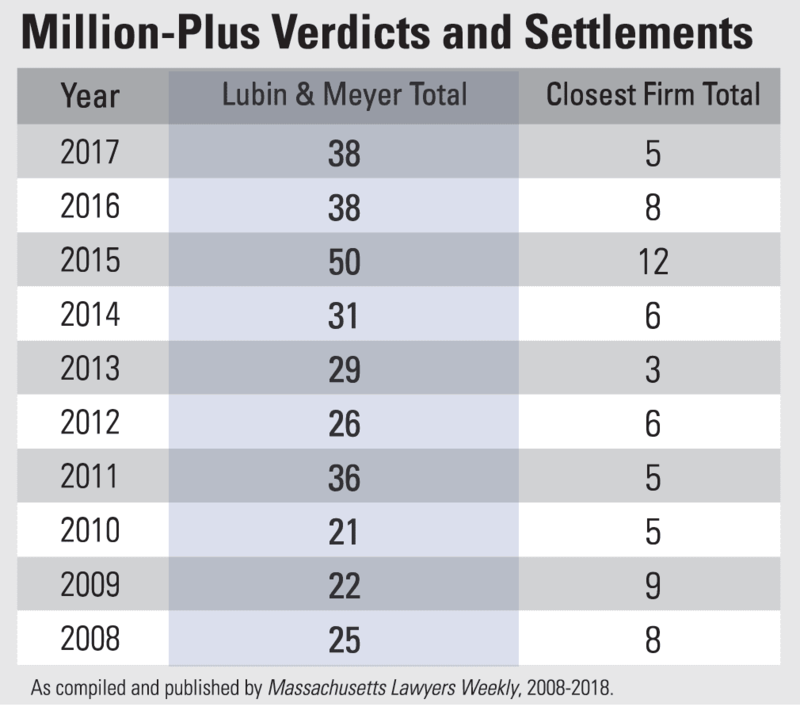 As described in a recent Rhode Island Lawyers Weekly ad (above), for 10 years in a row, the firm has earned more verdicts and settlements than any other law firm in the region, from 2008 to 2017. If you have questions about your medical care, please contact us for a free case review. Our attorneys regularly represent Rhode Islanders who have been injured due to their medical care. We also regularly receive referrals from local attorneys. We are happy to provide an initial case review or a second opinion at no cost or obligation. Please feel free to contact us with your questions.